We have a dog. 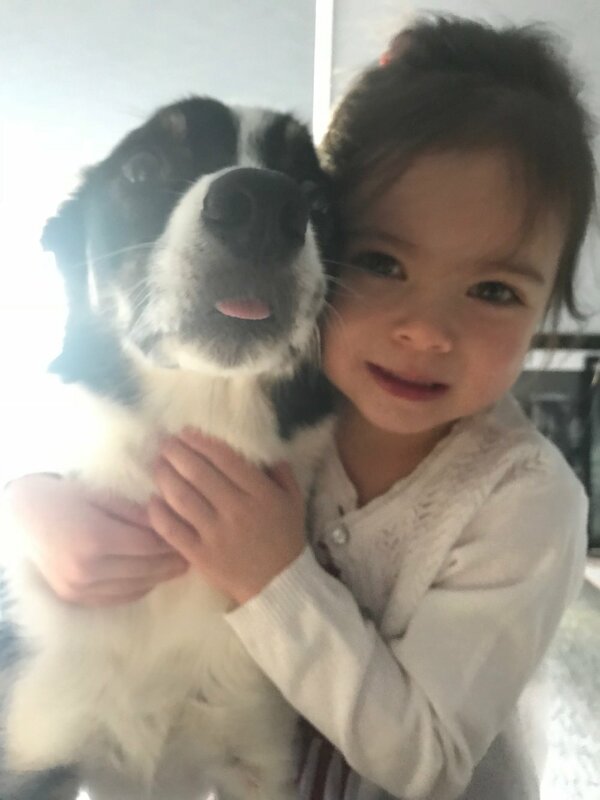 She is a 7-year-old border collie with almost as much love in her heart as she has energy in her soul. Her name is Lulu and she was made to work. She can often be found running around our kitchen island, whining for someone to play with her. She leaves large clumps of hair on all of our furniture. She will bring you a ball and stare at you, unblinking, until you cave and throw it for her. She likes to lick the floor or furniture if there is even the slightest possibility that something has spilled. She is terrified of thunder and lighting and hides in the shower when she is nervous. She is more likely to lick an intruder out of pure joy than do anything to defend herself or the family. Not to mention the fact that she broke her leg after having had her for just 10 days, costing us five thousand dollars during a time where we were barely making ends meet. And, in spite of all of her shortcomings, I love her. I love her not just for the companionship she has provided me, or the truly unconditional love she showers upon the family. I truly love Lulu for all she has given my children. Lulu is teaching Maelle and Linden every single day. She provides them with an understanding of obligation, ownership, and responsibility. From a young age, they have been involved in the feeding, grooming, and general caretaking of Lulu. As my kids develop, they will take on more responsibilities in the dog ownership department. They are learning how to care for another living thing. This has allowed them to be less egocentric and more compassionate as they provide for her and see to it that all of her needs are met. My children know what it means to have to make sacrifices to ensure that we have time to pick up her food, take her to the vet for check-ups, and go to the dog park to stimulate her need to work and play. Beyond the lessons in duty, she is also teaching lessons of love. She is a steadfast example to my children on what it means to be a good friend. She is always there for my kids, regardless of the mood they are in. Having a dog has taught them love without condition, without having to do anything more than just be themselves. Lulu asks for nothing from my children and has no expectations. Lulu never gets mad at them. She lets them sit on her, pet her, and kiss her endlessly. Lulu holds no grudges when they accidentally step on her paws or if Linden pushes the boundaries of a gentle pet a little too far. Lulu is a shining example of what it means to have fun, to run with reckless abandon, and to be happy with exactly what you have. Lulu is their friend, their confidant, and their secret keeper when the rest of the world seems to shut them out. When you become a parent, you quickly realize that you create the space for happiness knowing that inevitably, there will be times of sadness and pain along the journey. Lulu is the perfect example of this. Watching the relationships between Lulu and my children has been one of my greatest joys but, knowing that one day Lulu will pass away and perhaps teach my children one final lesson in loss, is hard to fathom. I can't predict how my children will handle her passing but I know that they are better off having had her to love and lose than to never have had her at all. There will be great sadness and the physical loss of our truest friend but there will also be gains; gaining all that she has taught, gaining perspective, and gaining a lifetime of memories to cherish forever. So right now, we will treasure the time we have with Lulu in the here and now. We will follow her lead when it comes to love and friendship and when the time arrives, we will nurture the grief our family feels from a place of gratitude, for we are thankful every day for her.